It is a pleasure to write about Lanjarón because it is one of my favourite places in the area to spend a lazy Sunday afternoon with family and friends and I often bring visitors here when they come to stay. Whether you are on a day trip from Granada or you are looking for a base from which to explore La Alpujarra, that is not too far from the city or the coast, the spa town of Lanjarón is a great destination. Known as the Gateway to the Alpujarra, it is only 15 minutes from the motorway, A-44/E-902 Autovía Sierra Nevada, and has much to offer. It is thought that the settlement of Lanjarón, which lies at the foot of Cerro de Caballo on the south-western foothills of the Sierra Nevada, dates back to pre-Roman times and that its name stems from the word lanchar meaning place of abundant water. You will cross the Río Lanjarón as you leave the town heading east into La Alpujarra. If you are coming the other way, between November and May you will catch a glimpse of snow-capped mountain above as you make your approach into town. Lanjarón is situated on what was the old Moorish silk route and, as it provided a natural gateway to the Alpujarra region, it was considered to be of some strategic importance during Muslim rule. The conquering Catholic King Fernando took the town in 1490 but Muslim inhabitants who had remained staged an epic, but ultimately doomed, rebellion in 1500. I don’t think that there is a single account of the history of Lanjarón that does not mention the so-called ‘Black Captain’ who threw himself from the Castello to his death in the face of defeat by the Christians. Yet another rebellion against Christian suppression was launched in 1568 but that too ended in tragedy and failure. Lanjarón was also key in the fight against Napoleon’s troops in the Spanish War of Independence, earning Lanjaroneses the alternative title of Cañoneros. Further evidence of this good fight is visible in the street-side installations of canons that you see as you pass through the town. If Lanjarón is famous for one thing that is its water. You will pass numerous drinking fountains – fuentes – in the streets bearing famous quotes inspired by the Lanjarón springs. And of course you cannot fail to notice bottled Lanjarón, now owned by Danone, in the chiller cabinets of tiendas all across Spain. 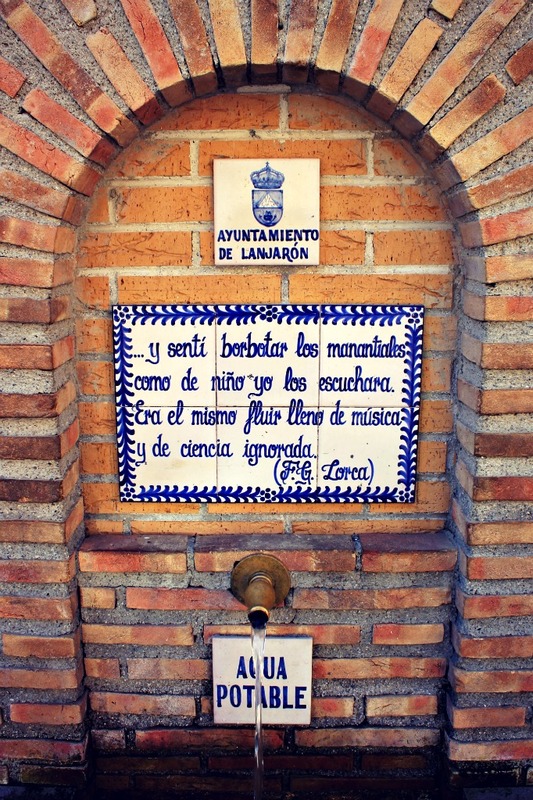 The thermal baths in Lanjarón were first established around 250 years ago, but it wasn’t until the end of the 19th century that they became internationally renowned. The iconic Balneario buildings were constructed in 1928 and the more recent hotel now adjoins. Around that time, ‘back in the day’, Lanjarón was a draw for the intelligentcia of Granada and famous visitors throughout the spa’s history include, amongst royalty, Federico García Lorca, Virginia Wolf and Betrand Russell. While in Lanjarón you can also visit the Water Museum, designed by Juan Donimgo Santos, which offers a fascinating look at the historical relationship between water and architecture in the region dating back to the Moors. And if that weren’t enough, there are more water-related, high-octane hi-jinks to be had at San Juan Fiestas de Agua y Jamón, one of the most important holidays in the Lanjarón calendar. On the the 23rd of June, La noche de San Juan, from midnight until the clock strikes one, people on the streets, most of whom have travelled in for the occasion, engage in the most spectacular water fight/street party. Also known as La carrera del agua, I suspect that this water festival/bunfight is second in the world only to Songkran in Thailand. Whatever, San Juan is always going to win in my book because it is easier to get home. For a really great post on this particular local spectacle check out this blog post on Spain for Pleasure. … and I heard the bubbling of the springs as a child hears them. It was the same flow full of music and science ignored. I am not sure why this park isn’t busier because it really is a lovely place to while away one or two hours. It offers a bit of respite from the heat in the summer and is fun for children of all ages the year round. The western entrance to the park is found just opposite the Balneario. This end offers a gentle amble along shady paths under eucalyptus trees and is rather well kept, with drinking fountains and little bridges crossing over a stream. You will also find a play park and an open-air stage for live music and cinema in the summer. 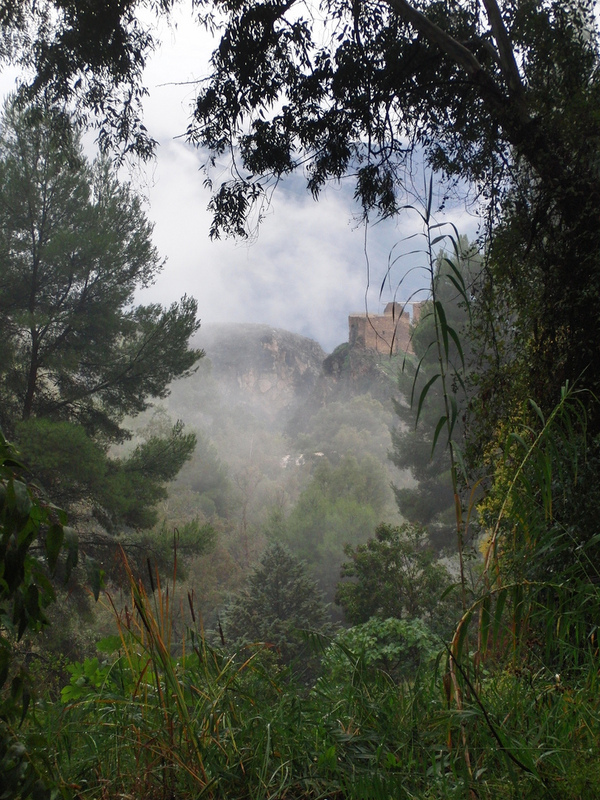 You can follow the walking path PR-A-345, as it drops down into slightly wilder terrain, all the way the the Castello Árabe at the eastern end. The castle is worth a climb just for the views. Car parking can be found close to both entrances. 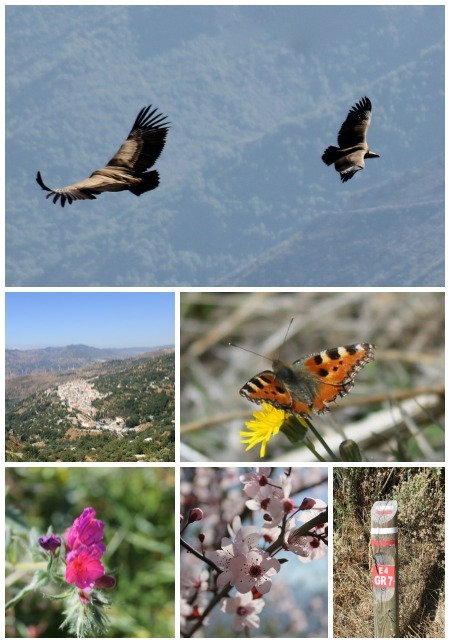 If you want to get closer to nature and explore your surroundings there are a number of activities on offer from Lanjarón including birdwatching with Alpujarras Birdwatching and Nature, horse riding with Caballo Blanco Trekking and walking and trekking with Spanish Highs Mountain Guides or Life of Riley. Lanjarón is also known for its rich honey production. The Honey Museum, located in the beautiful natural setting of the Berta Wilhemi Finca, is a great place to go if you have kids for them to learn about the fantastic healing and nutritional properties of honey, about bee keeping and honey processing, and about conservation and bio-diversity. To get there follow the sign on the left just before the Balneario as you enter town from the direction of Granada. Look for the Bee icon on the map below. If you have room in your suitcase and you are looking for souvenirs to take home such as traditional Alpujarran rugs, ceramica or wickerwork Lanjarón has a number of shops for you to browse. You will also find plenty of local honey, jamón and cheese to tempt you. Whether you are travelling solo, with friends or a partner, or with children you have some great holiday rentals and hotels to choose from in Lanjarón. The Alcadima is in a great location and has lots of outside space where guests can relax. If you want the full spa experience and feel like a bit of luxury the famous Balneario is the obvious choice. Or if you prefer something a little more low key and enjoy soaking up a bit of history and atmosphere have a look at Hotel España where the Lorca family stayed every year from 1917 to 1934. Check the map below for more information about hotels in Lanjarón. La Casita del Papel, which you will pass on your left before you enter Lanjarón from the direction of Granada, is a fantastic place to stop for lunch. The menu is very typical of the area; the food is great and beautifully presented. Try the habitas con huevo frito. If you have kids this is a great place to go for a lazy, sunny lunch as the restaurant is set back from the road and there is a children’s play ground right in front of the establishment. This place is popular with the locals, which is of course a great recommendation. At the other end of town, with quite a different vibe and culinary direction, is café bar El Bistro 31. If you are looking for something a bit more international in flavour, or you are a vegetarian seeking some respite from jamón-laden tapas, do check it out. It is just the place for a relaxed weekend brunch and a spot of people watching from one of the comfy booths on the terrace. It is also a lively evening hangout. If you are looking for something a little more elegant, and closer to fine dining, the restaurant at Hotel Alcadima should not be missed. 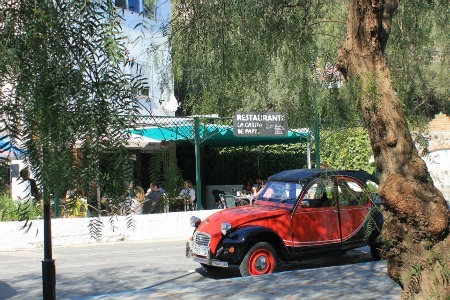 There they offer the combination of good food and outdoor dining with a fantastic view. You may want to book an early table, very un-Spanish, in advance as this is a busy hotel that also caters for tour groups. Click on a location marker or choose from the list below the map to bring up the info box. You can also drag the little yellow man from the top left corner onto the map to get a street view. GranadaSpain is the essential insider's website for planning a visit to Granada. The creators and contributors have all lived and worked in Granada and can offer the local knowledge you need to get the best out of your trip. In order to keep this site running and the information up-to-date, GranadaSpain.co.uk earns affiliate commission for some of the products/services/experiences recommended on this website. This is known as affiliate marketing and is used widely on the internet by many popular sites. We only recommend the products/services/experiences that we’ve used ourselves or think would be useful to our visitors. For more information please contact Sophie via our contact form.